Diamond pattern design rubber floor tile, continuous field design, factory cut 24" x 24" tile; easily and quickly installed. Ideal for stair landings, entryways, hallways, lobbies, elevators, ramps, concession stands, and vending machines; any heavy traffic area. Diamond design pattern matches diamond design stair treads in color and design. For indoor use only. Furnish and install No. 624-DL Diamond Design Tile from Discount FloorMat Store; 7/32" thick, 24" x 24" factory cut tile. 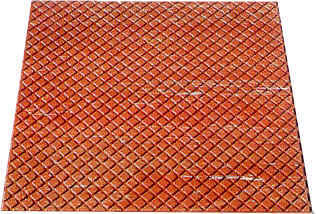 Tile shall have a continuous field pattern of 3/4" diamonds; a sanded back to assure proper adhesion; contain no asbestos fiber; molded of top quality homogeneous rubber compound, color extending throughout thickness; free from objectionable odors, blisters, cracks or imperfections which might impair serviceability.